This inner city heritage home overlooks the City of Calgary. It is sensuous in it’s warm mid-tone colors and sumptuous finishes and furniture. The finishes, furniture and fabrics are in rich, deep tones and layered textures that suit the age of the home and the homeowners sensibilities. This inner city, heritage home front entry overlooks the city. Expansive windows original to the entry, Crema Marfil and Nero Marquina mosaic marble tile floors nod to the age and character of the home. The red walls, gold glazed ceiling, McGuire bench, antique chest, side tables and bronze Buddah head make this spacious entry warm and welcoming. 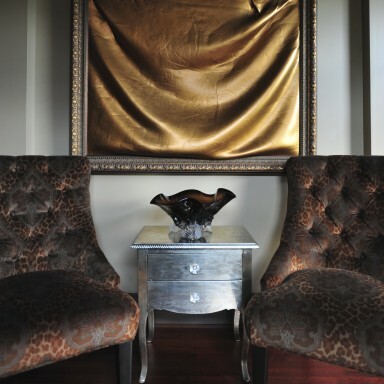 Two custom designed tufted, velvet chairs were created in leopard print paisley by PCD. 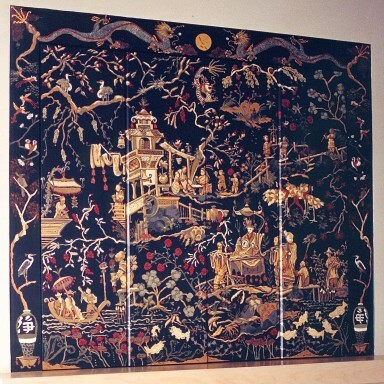 They flank a handcrafted metal chest. Local Artisan, Miriam Bankey, created this sculptural painting and frame after graduating from ACA. The sand-cast glass bowl was created by Mark Gibeau.